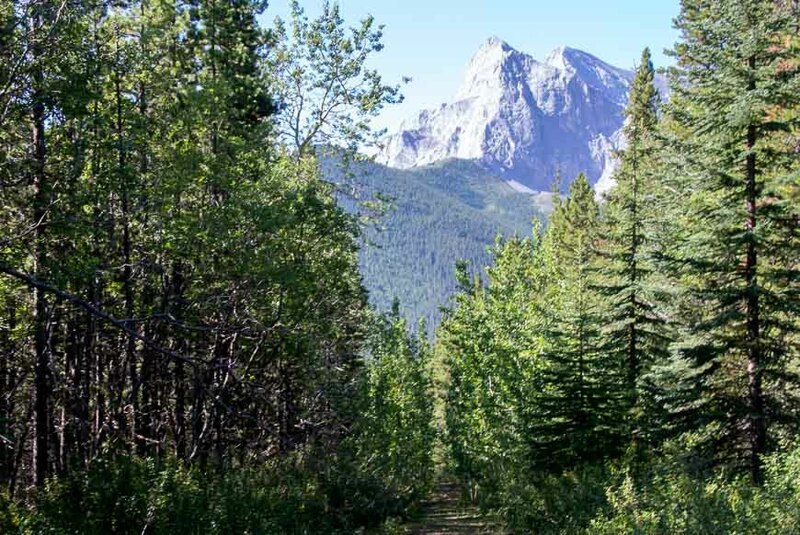 If you’re looking for a long out and back day hike in Kananaskis Country then the Centennial Ridge trail up to Mount Allan should fit the bill. If you want to turn it into an epic day, make it a one-way hike and descend to Dead Man’s Flats from Mount Allan but you’ll need a car shuttle to do that. If you do the out and back hike you’ll start and finish at the upper Ribbon Creek parking lot. But if you do it as a one way hike and finish at Dead Man’s Flat then you’ll need to leave a car there first thing in the morning. 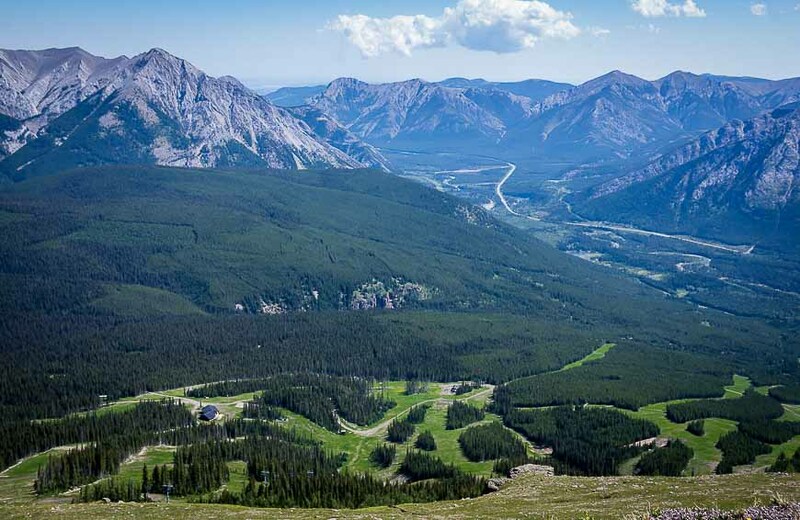 To get to the Centennial Ridge trailhead take Highway 40 south until you reach the turnoff for the Nakiska Ski Area. Follow the road until you reach Centennial Drive. It will be the first left you come to. Turn right onto Ribbon Creek Road continuing to the upper Ribbon Creek parking lot at the end of the road. To find the trailhead/parking lot at Dead Man’s Flat, take the Trans-Canada Highway and turn off at Dead Man’s Flat. Drive south for about two kilometres, climbing as you go. Just before you reach Banff Gate Mountain Resort turn right into a parking lot. This is also where you park for Skogan Pass. 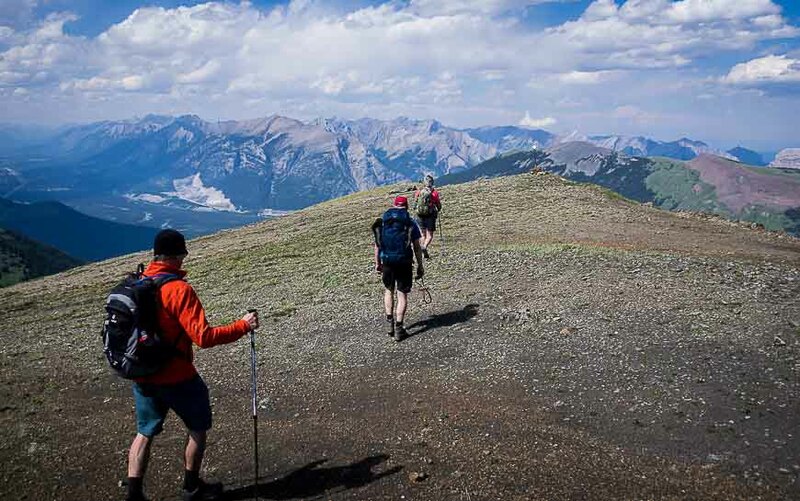 It’s a tough 7.8 kilometre hike to the summit of Mount Allan via the Centennial Ridge – with an elevation gain of 1,356 metres. 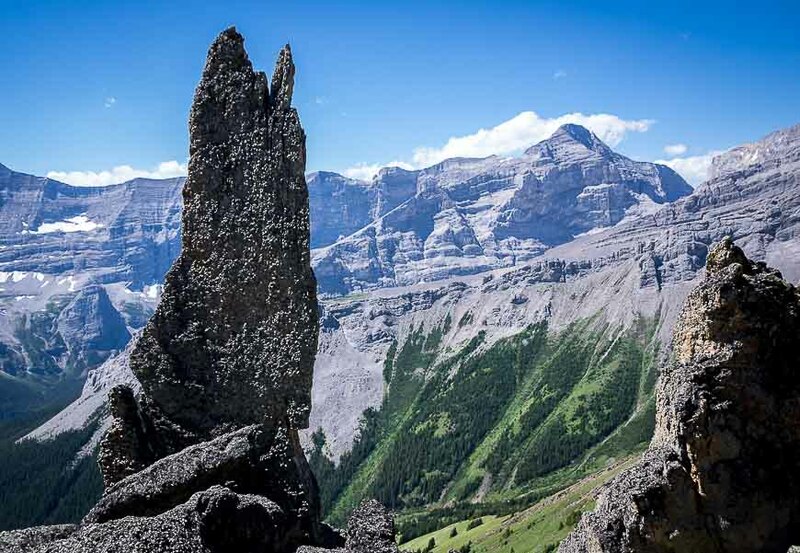 The summit sits at 2819 metres, ensuring it’s the highest trail in the Rockies, at least according to Gillean Daffern. Your knees, feet and hips will probably feel it by the end of the day. 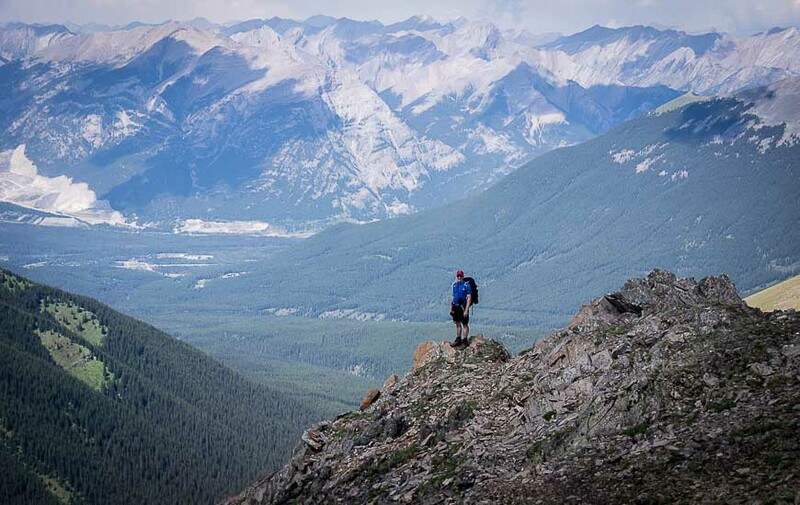 Most people do the Centennial Ridge – Mount Allan trail as an up and back hike. Finding the trailhead is a bit tricky as there’s a warren of roads at the beginning of the hike. We got turned around and lost about 15 – 20 minutes. From the northeast corner of the parking lot follow Hidden Trail. It’s signed. After about 300 metres turn left onto the Mount Allan ski trail, also called the Mt Allen Centennial Trail. When you reach the next T-junction turn left up the hill. (We made a mistake and went down. If you’re going down you’re not on the trail.) Cross the first of five roads. When you reach the second road turn right for a short way, climbing as you go. Cross the third road and then take a left at the fourth road. Look for the second road on the right and you’ll see the sign about spring closures. If you don’t get lost it will take you about 30 minutes to this point. Once you’re on the trail it’s pretty straightforward. Enjoy peek-a-boo views as you climb through the trees. Then you’re on a well-worn trail that ascends 610 metres over just two kilometres. At the Olympic Summit you’ll see a meteorology station and great views of the ski resort. From there it’s pleasant hiking on the ridge until you reach the dip. After you’ve dispatched with the dip you get into the beautiful Mushroom Garden. 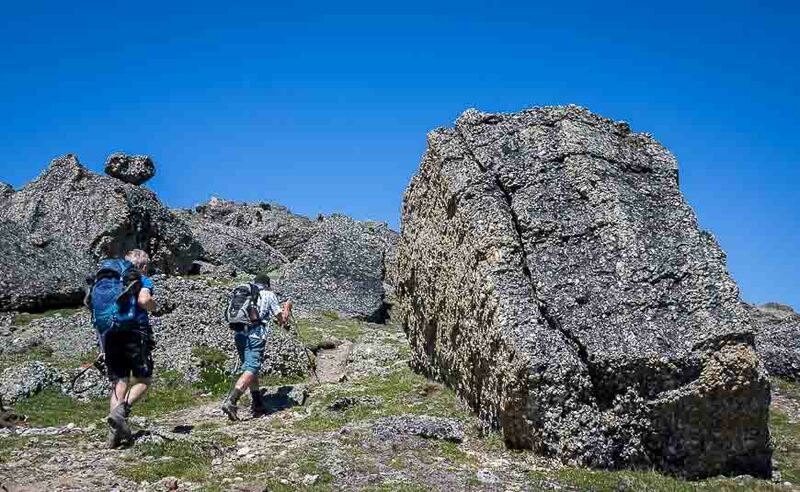 Hike through a row of oddly-shaped conglomerate pillars. At the gaps you can see the Memorial Lakes and several nearby peaks including Mount Sparrowhawk. There is some down-scrambling that can be challenging for some people. If you have a spotter for those that need it, this section will go faster. Then it’s up the steep scree – though it’s not bad – to the summit where the views down the valley towards Canmore are spectacular. Most people will retrace their steps. Poles would come in handy in a few places on the descent. You’re very exposed on the ridge so be prepared to turn around there is any sign of an electrical storm. Although the ridge in the above photo looks steep to reach from the summit, the hike down to it is actually straightforward. The walk along most of the summit is easy with an obvious path to follow. But at a few points it gets quite steep and you really need to consider your options before bounding down. 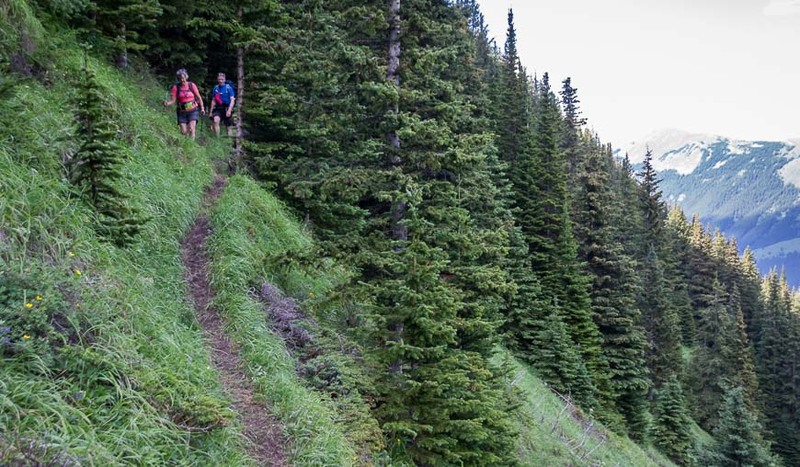 Bounding may not be what you’re doing – more like picking your way very carefully down. There is no signage so you have to go with what looks like the most used trail. The descent alternates between easy and difficult hiking – allowing you to catch your breath in between. When you get to the east side of a rock face, pictured five photos below – take your time, especially if it is the least bit wet and focus on your footing. When you pop out from this section it’s a steep but manageable descent to reach a trail that heads off into the woods. If memory serves me correctly it’s still at least 90 minutes to the car from there but the trail, even though narrow, is easy to follow. Unfortunately once you’re back into the trees it’s not very interesting hiking. Your thoughts by then are probably on a cold drink and a good meal. We made good time once across the valley and in the trees. If memory serves me correctly we took somewhere between 10 and 11 hours to do the 21 kilometres. (I may be a kilometre or two out on this number.) I know we left our house around 7 AM in Calgary and got home after 9 PM so it was one full but very rewarding day. We did have to take our time in several places on the descent where the ground steepened and was covered with ball bearing sized pebbles. 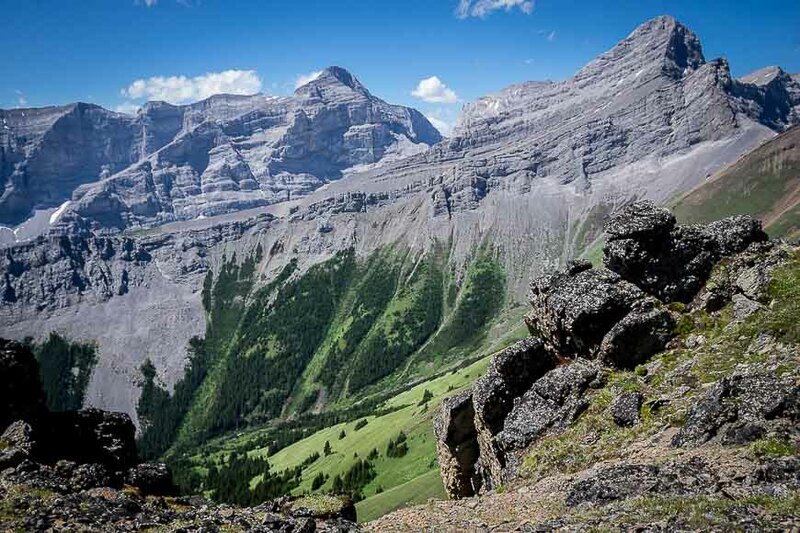 All in all the Centennial Ridge – Mount Allan – Dead Man’s Flat is one of the most impressive hikes I’ve done in Kananaskis Country. 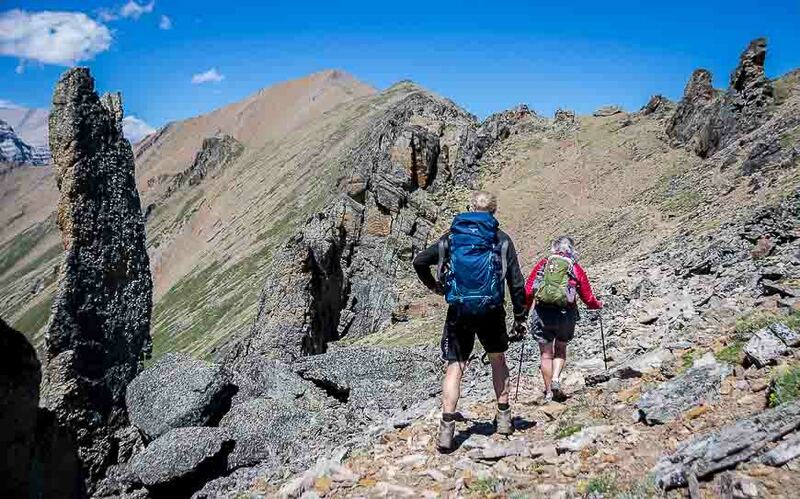 Give yourself lots of time so you aren’t hiking down in the dark; go prepared with the 10 hiking essentials including a wind-proof jacket and lots of water.